Engage students with concepts and technology from real-world labs. Since the company’s inception more than 30 years ago, National Instruments has grown from a three-man operation based out of the founders’ homes to a multinational corporation with more than 5,200 employees. As the company continues to grow, the entrepreneurial spirit that led to the creation and early success of NI remains entrenched in the company. At NI, we maintain a fun and innovative corporate culture by recruiting the best and the brightest employees and motivating them in a work hard, play hard environment. Our unique culture has not gone unrecognized; NI has been named a top 100 company to work for in America by FORTUNE magazine for 12 consecutive years. Visit ni.com/mydaqzone for more to download the instructions to build your own clap-on lights! This is an Air Guitar made with LabVIEW, a myDAQ, and less than $25 worth of supplies. This project won 1st place in the 2011 National Instruments Intern myDAQ Competition. A custom LabVIEW program polls Twitter for any mention of #popcorn, and for each Tweet, activates a LEGO Mindstorms NXT robot to power some Rube Goldberg sort of contraption that makes popcorn one Tweet at a time. With about $25 and NI myDAQ, you can create a secret knock door unlocker. Watch as Application Engineers Chris Van Horn and Misha Kotov show you how. 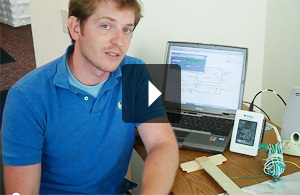 See how engineers use the new real time math feature in LabVIEW 2009. Presented at NIWeek 2009, the world's leading graphical systems design conference. To prototype and build an optical encoder. NIMyDAQ hardware will be used with LabVIEW to acquire, analyse and present thedata. This Lab will give you step by step instructions so whatever your LabVIEWexperience you will be able to complete this lab. Copyright © 2012 Sasbadi Sdn Bhd (139288-X). All Rights Reserved.